I really ate way too many Christmas cookies. Way, WAY too many. (Popped them into my mouth like mini-m&m’s, and now there are clothes that don’t fit.) Since I’m still craving a cookie fix, I thought I’d try a lighter alternative as Step 1 in my 12-step “Lay off all those sweets” program. a crispy, lofty center. Yum! I piped them onto parchment paper with a Wilton 4B tip which, honestly, was probably not the best choice. The chips tended to bunch up and jam the tip, so I had to move things around with a toothpick. You can drop by simple teaspoonfuls, but I think I’ll search around for a jumbo star tip to add to my stash. These cookies are only 20.7 calories each and they are sweet enough to satisfy those I-can-eat-sugar-from-the-sugar-bowl cravings. If I can eat them in moderation, I’ll be in good shape because 20.7 + 20.7 + 20.7+…can only come to no good. These are SO cute. I love them and I love black cherry! 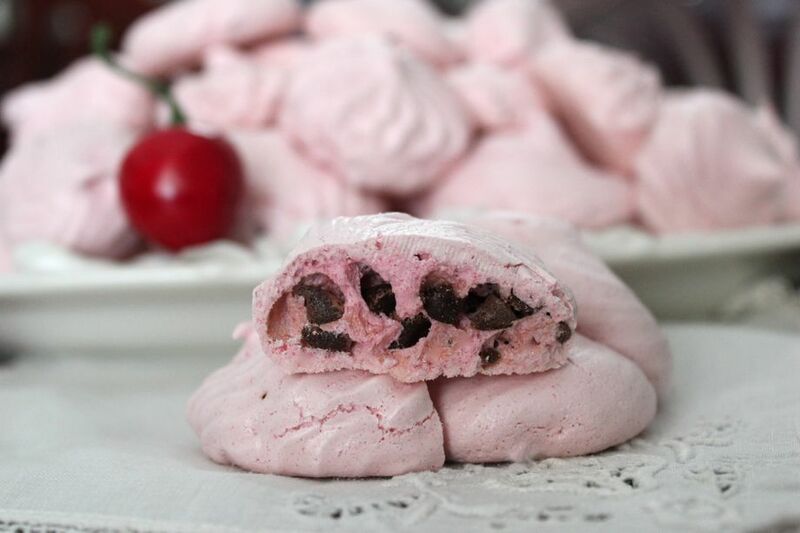 Welcome to the world of meringue cookie lovers! 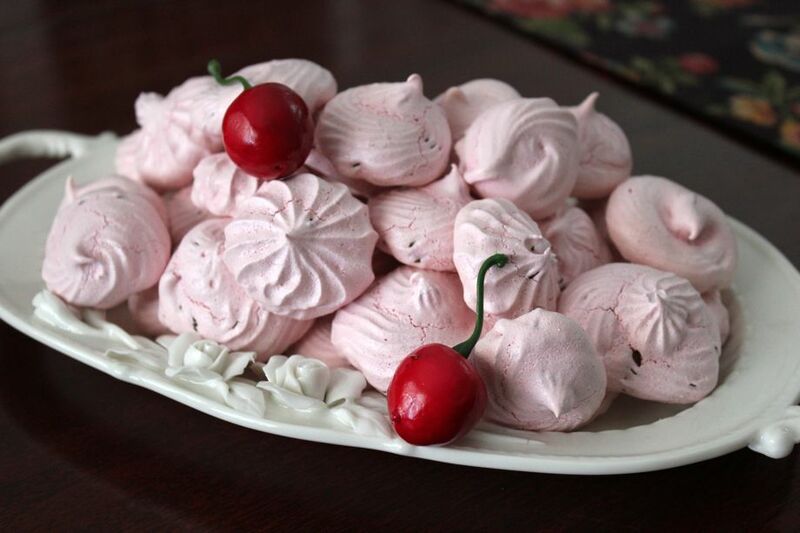 I added a little espresso coffee powder and minichips to the meringues on the Christmas cookie tray, but I’ve never added a fruit flavor. I might have to break my resolution NOT to bake another cookie until the leftover Christmas cookies in the freezer were eaten…but raspberry and chocolate?..yum..and red cookies would be great on a Valentine’s Day tray. I’ve seen green minty recipes, but I’m lovin’ the espresso idea! I think those are up next.